A Heart Touching Experience of Awareness to the Children with Special Abilities at Amar Jyoti School. Disasters and School Safety Programs. •	Children for any country is the greatest resource and all the efforts should be made to provide them with properly planned and designed Infrastructures, Safe Transports and most importantly making them aware, as to how to respond in case of disasters, among others. •	School children are one of the most vulnerable sections of society who got constantly hit by the adverse impact of disasters in the past. This leaves a huge responsibility on us as a society to save our children during School. Thus, School Safety Program becomes a necessity for us. Why School Children are more Vulnerable? Few of the prominent reasons for this may be attributed to following 1. Schools are often most densely populated during the day time. Disaster Management for School Children is always a big responsibility on us as a society, but this responsibility becomes more crucial when it is related to differently abled Children. Imagine a case where, someone is on a wheel chair in room with a friend, who is not specially abled, during a disaster. 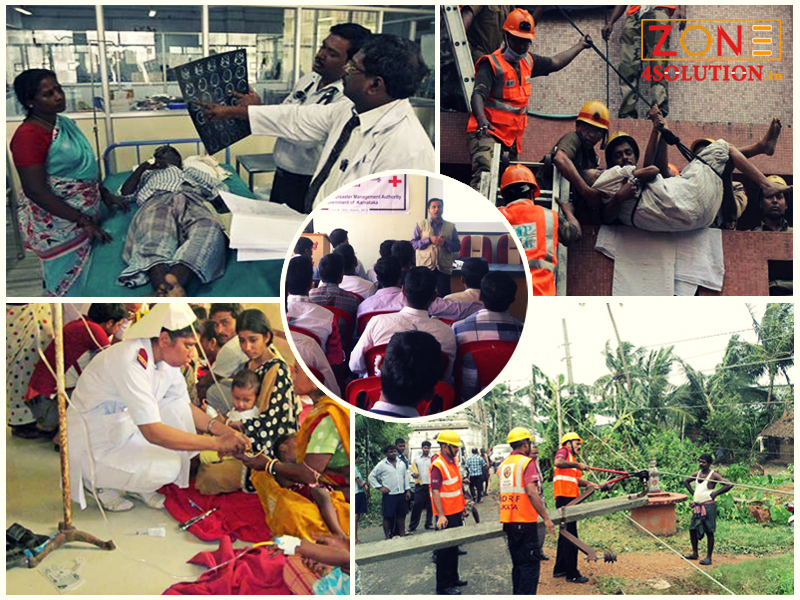 Professional Training and Sound disaster Management becomes more crucial to deal with such situations. The incidents of Natural Disasters, Fire, Active Shooter, Terrorist Attacks, Unplanned releases of Chemicals in a school etc. have made it mandatory for Schools to plan in advance for mitigating the risk of disasters. An effective emergency evacuation plan is an essential for specially abled children. The most risk areas for specially abled children are harm from burns, smoke inhalation, or by being in harms way of an active shooter, etc. Thus, Schools systems must have the capacity to move all students, staff, and visitors with disabilities to a safe location immediately at the time of an emergency. In some cases it found that the special students were told to not come to Scholl on the drill day. However, the need is to include them in drill and train them to save their lives. The Checklist- What are the steps to be taken by the Schools? 1. Schools may implement the use of a stair evacuation device. 2. Two-person lift, or med sled as a means of removing someone in need from a multi-floor building. 3. Educating the Educators- Staff must be trained on the use of evacuation devices. Drills must be carried out to ensure everyone’s safety and ability to use devices during the need. 4. A comprehensive written Emergency and Evacuation Plan individualized to meet the student's needs. This plan should ensure: • full mitigation • practice drills • staff training 5. Evaluation process to identify potential obstacles during an Emergency. Amar Jyoti school was established in 1981 at Delhi, under the aegis of Amar Jyoti Charitable Trust. Amar Jyoti is a voluntary organization rendering rehabilitative services to persons with disabilities through a holistic approach of inclusive education, medical care, vocational training, child guidance and self-employment. The school has in total 501 students. Out of 501 students 279 students are special. Thus, a sound School Disaster Management plan (SDMP) was needed for the individual needs of students, including those, who have physical disabilities, sensory disabilities, or, those who lack understanding of a situation or are unable to act quickly. As a disaster manager, I found that the entire campus is accessible to all. It has tactile path, ramps, loop induction and disabled friendly bus for school students. The School has received the National Award by the President of India for creating barrier free environment. How SDMP of Amar Jyoti School was different? Our team at Zone4Solution has prepared hundreds of SDMPs and executed hundreds of evacuation drills . However, this drill witnessed more than 50% special children. Normal students can walk, can hear and raise questions to us, but in this case, all students could not hear us and could not even hear the emergency rings. My team could not directly impart training to these students. Thus, first we trained their special trainers. there after a SDMP, their SOPs and Evacuation maps were prepared with the help of special trainers. a mock drill was organized on 6th April,19. We organized a Table Top exercise successfully conducted the drill with our team and special trainers. The three stories building was evacuated in 4 minute. The special was the spirit of specially abled children as some of them evacuated the building through their wheel chair, others with the help of their buddies others walked to the assembly point. I never had seen such a perfect drop cover hold before, they are truly specially abled! What We should look for in a good school? Being parents, we must check, among other criteria, if the school has a Professional School Disaster Management Plan, do they conduct Mock-drills time to time in letter and spirit. Ask the schools to produce safety Audit Reports, Transport Plan and disaster recovery plan. In case you need a counselling on the matters of Disaster Management for the school of your children, feel free to contact us. We are a Team of Disaster Managers, Ex-Fire Officers, Professor at various universities.